Jacques Maghoma's goal was enough for Birmingham City to beat struggling MK Dons and move to within one point of the Championship play-off places. The Dons came closest in the first half when Daniel Powell forced Tomasz Kuszczak into a smart save. After the break, Blues striker Clayton Donaldson smashed against the crossbar from just eight yards out. 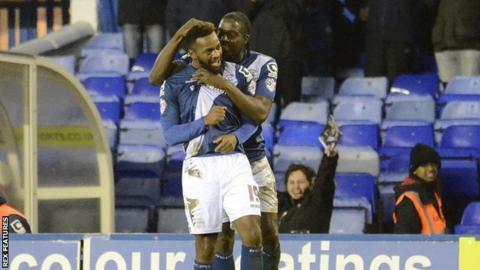 But Maghoma grabbed the winner after 63 minutes by twisting and turning before firing home left-footed from 12 yards. In the dying moments substitute Demarai Gray was denied by the post but it mattered little as Gary Rowett's side earned their second win in eight matches. Despite the defeat, the Dons, who had two shots on target all match, remain 20th after Charlton and Bristol City both lost. Karl Robinson's side never really got into the game, with their former midfielder Stephen Gleeson rolling past the post and David Martin saving from Jon Toral's free-kick in a lacklustre first half. Dons captain Dean Lewington might count himself lucky not to have conceded a penalty when Blues claimed he handleda cross from Viv Solomon-Otabor in the area before the break. But after Donaldson scuppered a chance to make it 10 for the season, Maghoma finished with aplomb and Birmingham were never really troubled as MK Dons remain without a Championship away win since their opening day victory at Rotherham. "I think we were well worth our win and should have gone on and made it more comfortable. "I felt with Clayton Donaldson back was a massive lift for us. I thought Jon Toral was really good playing with lots of quality and Jacques Maghoma was brilliant as well. I think those three were very difficult for MK Dons to handle. "It was a magnificent goal from Maghoma. I've looked at the goal again and there were five defenders between him and the goal and as he turns all five go the wrong way as he hits a great finish. He deserved that goal." "We were beaten by the better team. We rode our luck. It wasn't our day. The changes I made didn't work. "Losing Daniel Powell with a leg injury so early in the game was a big loss. Once he came off I thought we went backwards. "The work ethic was there. I was proud of their effort but we had an off day. We just didn't turn up and I cannot put my finger on the reason. "But we are learning all the time and we are going to get better by the back end of the season." Match ends, Birmingham City 1, MK Dons 0. Second Half ends, Birmingham City 1, MK Dons 0. Attempt missed. Nicky Maynard (MK Dons) header from the centre of the box is close, but misses to the left. Assisted by Dean Lewington with a cross. Demarai Gray (Birmingham City) hits the right post with a right footed shot from the centre of the box. Assisted by Clayton Donaldson. Josh Murphy (MK Dons) is shown the yellow card. Offside, Birmingham City. Paul Robinson tries a through ball, but Clayton Donaldson is caught offside. Offside, MK Dons. Dean Bowditch tries a through ball, but Nicky Maynard is caught offside. Carl Baker (MK Dons) is shown the yellow card for a bad foul. Maikel Kieftenbeld (Birmingham City) wins a free kick on the left wing. Hand ball by Clayton Donaldson (Birmingham City). Substitution, Birmingham City. Demarai Gray replaces Viv Solomon-Otabor. Attempt missed. Ben Reeves (MK Dons) left footed shot from outside the box is high and wide to the left. Assisted by Diego Poyet. Substitution, MK Dons. Ben Reeves replaces Joe Walsh. Attempt saved. Maikel Kieftenbeld (Birmingham City) right footed shot from outside the box is saved in the centre of the goal. Offside, Birmingham City. Jon-Miquel Toral tries a through ball, but Clayton Donaldson is caught offside. Corner, Birmingham City. Conceded by Diego Poyet. Attempt saved. Samir Carruthers (MK Dons) right footed shot from long range on the left is saved in the centre of the goal. Paul Robinson (Birmingham City) is shown the yellow card for a bad foul. Josh Murphy (MK Dons) wins a free kick on the left wing. Attempt saved. Jon-Miquel Toral (Birmingham City) left footed shot from the right side of the box is saved in the centre of the goal. Assisted by Stephen Gleeson.